« Money back at last! The small and very handy IR-remote Canon RC-5 has a lot going for it and two things against it: It requires the camera to be “On” and this draws power and it must have a free line of view to the camera. Enter the Radio Remote for Canon EOS 550D/Canon Digital Rebel T2i – and many other cameras! In this case JY-110 from Deal Extreme. As can be seen in the picture on the left it consists of two parts: transmitter and receiver. It has a working distance of at least 100 meters! (If there is no radio wave blocking obstacles in between!) But you do not really have a line of view between the camera and the transmitter. Especially this is true when you are close, 5-10 meters, then its radio waves goes through a lot of obstacles! The kit seems reasonably well-built – without having a super finish. Is equipped with two buttons and two LEDs. The receiver connects to the DSLR via a 25 cm cable to a small 2.5 mm stereo headphone jack. It can be fitted in the flash hotshoe on the camera or just used “dangling” in the cable. You can pair transmitter/receiver with each other by selecting one of the available 16 channels on a small DIP-switch. This lessens the risk of interference from other radio transmitters. The simplest way of using the receiver is in “Off” mode. It then works as a wired remote shutter release! Use it to lessen camera shake or just for convenience. The release button has two pressure levels – exactly as on the camera; the first sets the focus; the second releases the shutter. There is no delay – it is as pressing the release button on the camera! Switching the receiver “On” is by the smaller button just to the right of the shutter release button. This lights up a red LED on the front indicating that the receiver is ready and listening for the transmitter. One more press on this button switches it off again – and extinguishes the LED. Note! This “Power on”-LED is so weak that it is both very easy to forget it “On” and not to see it. I do not know if this is a fault of my sample or if it is by design to save power. Because it uses a press-on, press-again-off button it can be switched on by accident if you keep it unprotected in your camera bag. The receiver is using a 3Volt type “CR2” lithium battery. Mine ran out very quickly – I do not know if I forgot it “On” or not. I think I had it “Off” but it still ran down the battery! Is equipped with one pressure button, one slide switch and one LED. The transmitter is always “On” so there is no “Power on”-switch. It also has an antenna that can be pulled out to increase the working distance. The large button is the release button and it also has two pressure levels – exactly as on the camera; the first sets the focus; the second releases the shutter. As you press this button a two-colour LED just in front of the button lights up in green to indicate focus and when you press harder it lights up in red to indicate shutter release. The same happens at the receiver a bright LED indicates green and red. The setting of the slide switch controls what happens next! First setting (downwards) with the small “G”-like symbol gives a two second delay before the picture is taken! The red LED blinks during these two seconds. It really works over 100 meters – I have tested it – but it is impossible to see the LEDs at that far away distance – it is even difficult to believe that a picture has been taken! But it has! The transmitter is using a 12 Volt type “23A” battery. This is said to last for 20 000 exposures – which I have not tested 😉 – but I strongly doubt it … but on the other hand I will have to wait very long to find out – even if it only lasts for 5000 exposures! Using the radio remote will actually focus the camera at the first soft press but then it will not start the video recording when you press harder. It will “only” trigger the shutter – just as it does normally! You can however use the infrared (see my blog post on that) to control the video recording! This entry was posted on September 29, 2010, 22:51 and is filed under Camera Remote, Camera Stuff. You can follow any responses to this entry through RSS 2.0. You can leave a response, or trackback from your own site. 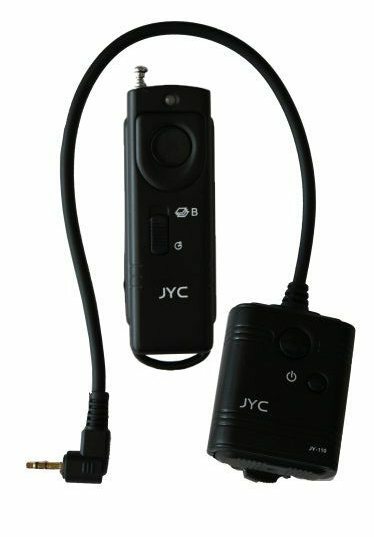 Do you know if the JY-110 remote works with the CANON Rebel T2i? Yes, it does work! The EOS 550D and the Rebel T2i are the same camera – just the name badge is different! I use it a lot with my 550D and it works beautifully! Just remember to remove the battery from the JY-110 receiver when you do not plan to use it for a while! Does this work for the T1i? Yes – it actually works with all Canon cameras that has a 2.5 mm remotre control jack. Thanks for the information about using this piece of kit, I can’t track down my manual. I’ve not used it for awhile and have the following problem. The LED on my receiver does not light up and signals from the transmitter are ignored (its LED does light up). So I am assuming the battery in the receiver is dead, although I can still use it as a shutter release? Yes it works as a wired shutter release even when the battery is dead. I actually remove my battery from the receiver when I don’t plan to use it for a day or so. As I said in my review I think it drains the battery even when it is switched off – I am more certain that it actually does that now – having used up a few more batteries! Using the radio remote will actually focus the camera at the first soft press but then it will not (as I assume you hope) start the video recording when you press harder. It will “only” trigger the shutter – just as it does normally!